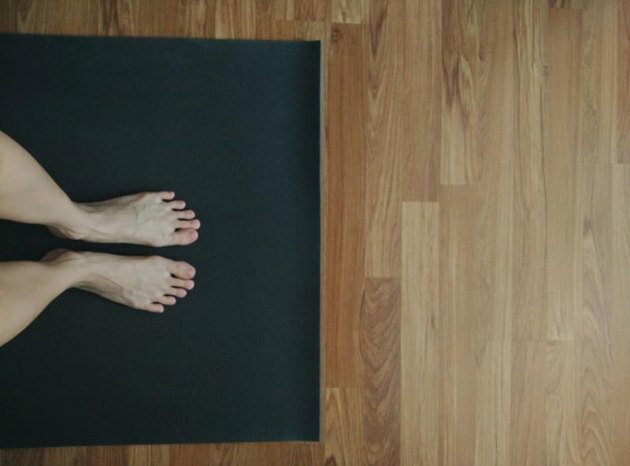 It's hard to find your yoga bliss if you spend most of class fighting sliding hands and feet on a slippery yoga mat. A mat that just isn't sticky enough can be a source of extreme frustration, so much so that you may abandon practice altogether. It's not yoga's fault! Your mat needs just a little love and care to prevent you from feeling like you're at a backyard slip 'n side rather than in practice. Yoga mats should be broken in. They're coated with a preservative to keep them pristine on the shelf, but this coating makes them slippery when you start to practice. Over time, friction, your bodily oils and sweat wear down the surface so you get the grip you want. You might not have the patience to wait for the natural break-in process to occur. A chemical-free way to break in your mat, recommended by yoga mat and clothing company Manduka, is to unroll your mat, cover it generously with sea salt and allow it to sit for 24 hours. Remove the salt using a damp towel, and you should have a stickier surface. You might find a quick rubdown also helps dissolve the slipperiest of surfaces. Use this solution on your mat before any practice. Just spritz down your mat and towel it off. Shake the ingredients together in a spray bottle. If you have active sweat glands in your hands and feet, even a clean, worn-in mat may just not be enough to keep you stable. Specially made slip-free yoga towels come to the rescue! These differ from a bath towel as they're made from sweat-wicking fabric and have grippy feet on one side so they stay put. Lay one over your mat and, get its grip started by spritzing it down with water. As you practice, your hands will stay put on the surface. These mats are thin and won't interfere with your connection to the floor. Read More: Do You Need to Use a Yoga Mat? If you don't want to lay an entire towel over your mat, opt for mini versions in the form of socks and gloves. These accessories provide a thin cover for your hands and feet that absorbs sweat and features little nubby grips to keep you in place on your sticky mat. If you go to yoga after a sweaty run or weight-training session, you're destined to slide. If you can, shower before you head to class and dry off thoroughly. Skip the lotion before class, too. You might smell good and feel moist, but you'll definitely pay with a slippery experience.